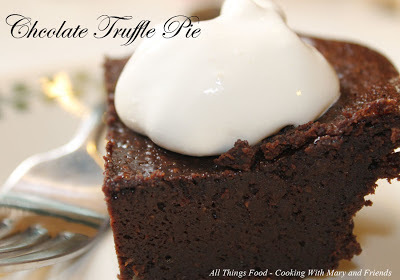 Cooking With Mary and Friends: Chocolate Truffle "Pie"
Well it's called a "Chocolate Truffle Pie," but it's much denser than a pie, almost more of a cake-like texture and very rich! Tastes just like a truffle, only in a pie, and a little bit goes a long way! Serve with a dollop of whipped cream or sprinkled with Confectioner's Sugar. Original recipe from Baker's Chocolate. 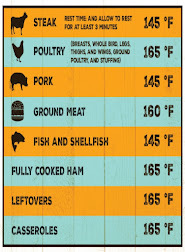 Heat oven to 325°F. Microwave chocolate and cream in microwaveable bowl on high 2 min. or until chocolate is almost melted; stir until completely melted. Cool. Whisk in eggs, sugar and flour. Pour into 9-inch pie plate sprayed with cooking spray (I use a 9" square baking dish). Bake 35 min. or until edge of pie is puffed but center is still slightly soft; cool. Serve topped with remaining 1 cup whipped cream. Note - edges do puff up alot and the center will some as well. As it cools, it sinks a bit and pulls away from the edges of the pan. Pie is very dense.